Happy MLK Day everyone! I hope that you got to have the day off today and relax. Maybe you even got to sleep in and fix a nice breakfast! 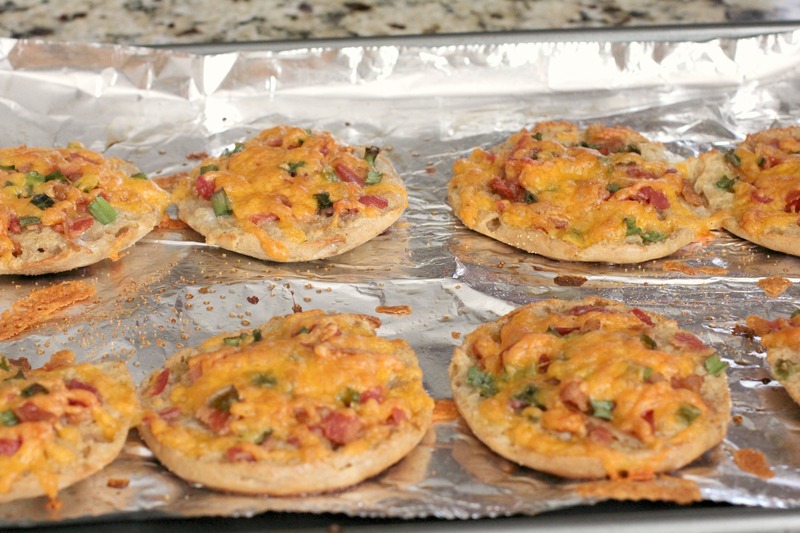 Maybe the next holiday you get, you can make these delicious mini-pizzas for breakfast! Of if you’re always on the go, you could make these at the beginning of the week and have a quick, mess-free, on-the-go breakfast each day. Oh and did I mention these are delicious? I’m gonna be honest, I really did not think these would be so amazing. I mean, it’s just a muffin with some toppings, right? WRONG! Somehow, this is more than what it seems. 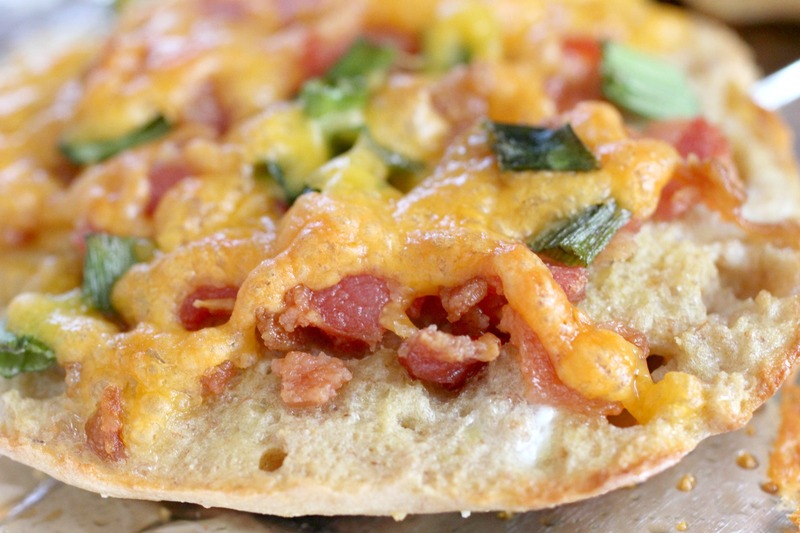 The egg-soaked bread, the combo of toppings, the oven-baked cheese, oh…it’s just all so good. I took these to my Sunday School class, and they gobbled them up! They were a big hit! I like how customizable these are too. I used bacon and green onions as my toppings, but you could use ham, sausage, bell peppers, and any number of things to satisfy your tastes. You could even do different toppings on each muffin so that every member of your family gets what they want! Optional: Chopped vegetables like green onions, tomatoes, sliced olives, mushrooms, green peppers, etc. Preheat oven to 400 degrees. Line a baking sheet with aluminum foil and spray liberally with non-stick cooking spray. In a shallow dish, whisk together the eggs, milk, salt, and Tabasco sauce. Slice each English muffin in half and soak each side (like you would for French toast) in the egg mixture–you want the egg mixture to soak into the bread, but you don’t want the English muffin to be completely falling apart. Place the muffin, cut side up, on the baking sheet. 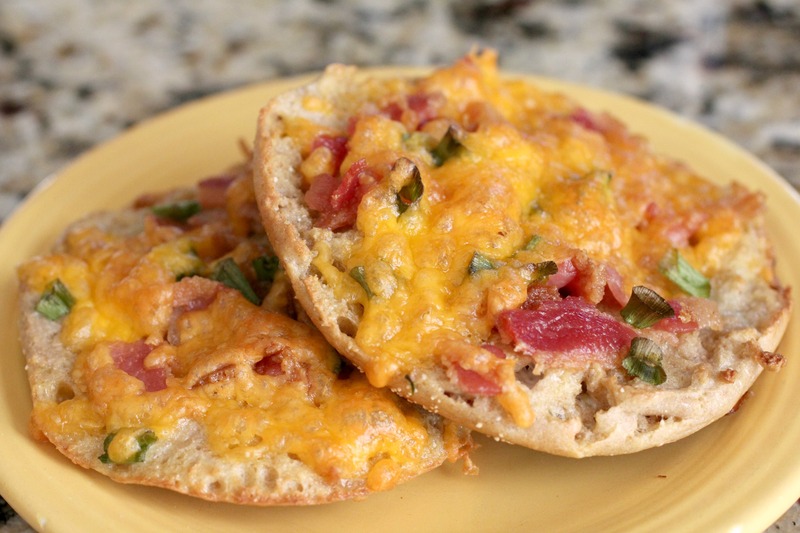 If using ham, slice the ham into thin strips and then place on top of the English muffins. If using bacon, just sprinkle the crumbled bacon on top. Add any additional desired toppings and then sprinkle with shredded cheese. Bake for 15 minutes and serve immediately. FREEZER INSTRUCTIONS: After baking, loosen them from the baking sheet with a spatula and then allow them to cool completely. Transfer the baking sheet to the freezer. When the pizzas are solid, transfer them to a large Ziploc freezer bag. To reheat, place on a plate and microwave for 1 minutes at a time until the pizza is heated through.